October was not a particularly kind month to the Scottish national soccer team; turfed out of the World Cub 2018 competition after failing to win a crucial game against Slovenia. If that wasn’t bad enough, archrival England were in the same qualifying group. It won the group outright and therefore advanced. No bagpipes allowed at the crucial game? Sadly, there is more to the tragedy. According to the BBC, the 4,000 Scottish fans that followed the team to Slovenia were, at first, not allowed to bring bagpipes to the game. Negotiations between the Scottish and Slovenian football associations resulted in a change of heart. You can imagine how delicate those negotiations must have been: Slovenia probably insisted on one bottle of single malt per set of bagpipes as compensation for having to listen to them. Although the Scots brought their bagpipes along, the pipes failed to help the team in its hour and a half of need. This leaves as sour a taste in the mouth as fresh haggis. Will the storied power of the bagpipes, to terrify enemies in battle and give hopelessly outnumbered Scottish warriors a fighting chance, now become fiction? Moreover, will other legendary characteristics of the Scots come up for review. Perhaps people will lose interest in finding out what, if anything, Scotsmen wear under their kilts. Will the Scots now become objects of derision? Perhaps credit companies will start making commercials that ask cartoonish Scots, “What’s in your sporran?” Did we reach ‘peak Scottish,’ a few years ago, with the publication of the ambitiously titled book ‘How the Scots invented Canada,” with the Slovenian bagpipe incident marking the first measurable stage of the decline. Bagpipes are a rich source of jokes. 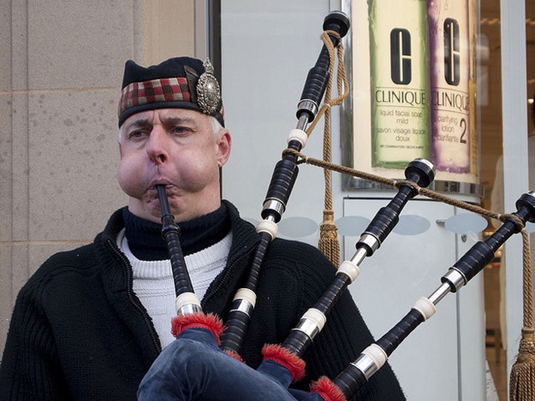 If, and it is a big if, bagpipes have any redeeming value, it is as noisemakers. Not in Vancouver, mind you, where a 2012 by-law banned the use of bagpipes and other percussion instruments from use on the streets; that is, I guess, by buskers. One bagpiper came to the defence of his chosen instrument by noting that the lawnmower, used by his next-door neighbour, operated at a higher decibel level than his bagpipes. Well, at least he made an accurate comparison in tonal quality. Noisemakers are an integral part of the spectacle of the World Cup. The most notorious example was at the South African venues, in 2010. The noisemaker of choice was the vuvuzela, a long horn-like implement that made a terrible toot, to the point of distraction of those unused to it. You can by a vuvuzela on Amazon for four dollars; a starter bagpipe kit will set you back five hundred bucks. You decide whether the bagpipe or the vuvuzela is the more cost effective way to achieve the result. Organizers of the 2018 World Cup, set for Russia, have already selected their noisemaking weapons of choice, wooden spoons. Known as the “spoons of victory,” this noisemaker consists of two back-to-back wooden spoons joined together with a flexible grip and decorated with Russian heritage patterns. Perhaps Scotland should start refurbishing the reputation of its bagpipes by declaring independence from the UK, bidding successfully to host a future World Cup and introducing opposing teams to the sound of 60,000 fans playing the pipes in support of their national team. If done properly, opposing teams will be scared to set foot on the pitch at the sound of bagpipes and scream fans. Some skeptics may see this as confirmation of their view of the Scottish, that is, poor genetics, short and weak. The BBC put statistics to work to test the excuse. It analyzed the top fifty teams in the world. Although Scotland had the second shortest team, the shortest were Spain, which won the World and European cups; the third shortest were Portugal, the reigning European champions. Height isn’t an excuse. As for weight, aren’t Scots notorious for their feats of strength in tossing the caber and putting the shot? Besides, it’s quite un-Scottish to look for excuses for yourself. Team manager Strachan subsequently chose to resign his position, presumably just before the boot print left a mark on the backside of his kilt. A Scot never pays full price. Yes, so far, October has been a bad month to be a Scot. The future seems brighter, though. A big liquidation sale at Sears started this week. Nothing will be at the regular price, a price, which, as a matter of national pride, a Scot never pays.